• Improve your vehicle's exterior styling, ultra light weight. • Provide your car with a unique LUXURY look, stand out from other stock OEM look. • Grills are made of HIPS, BEST quality as Shown in the pictures. • Instruction not included; However, Since this grille is a direct replacement of the stock OEM grille, buyer can refer to the instruction from dealer how to remove and replace stock grille. • Easy installation. No modification is required. Fits like OEM grille. • For 1995-2001 BMW E38 (740i 740iL 750iL) . * Beware of mid-year auto mfg. changes. It is your responsibility to double-check with mfg or automotive forum to confirm fitment. Data is best of our knowledge. We are not liable for any errors. A. 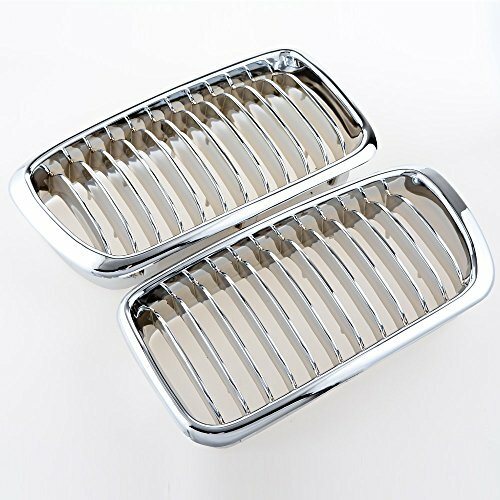 This grille is made of High Impact Polystyrene (HIPS) material, which is commonly used in the OEM grille. A. No. It does NOT require any modification to install this grille. A. No it does NOT come with any installation instruction.